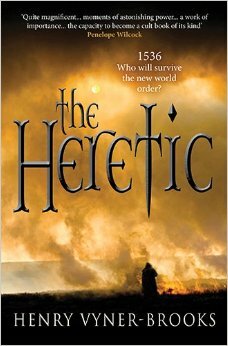 The Heretic takes place in Reformation England from 1536 to 1539. There are many layers to the story. The two main groups of characters are a monk, Pacificus (who is actually a disguised knight, Sir Hugh Erpingham, and has interactions within both his personas), and a family of “heretics” who are persecuted for believing and practicing outside the official church (becoming an “extended family” as the children are sent to live with a family of Anabaptists while the parents are charged). There are also some recognizable historical figures. I have only basic knowledge of this time period, so I was hoping this novel would help me to learn a bit of history in an enjoyable way. I did feel as if I could envision the scenery and setting, but otherwise I had trouble following the overarching historical-political events. I would summarize that the writing is historically very strong, but only to those who are already familiar with the period. The story is good, but also very slow (603 pages, covering a span of years). It is overly thorough in some areas, while neglecting to fully connect the dots of the historical picture in other places. I was interested just enough to keep reading, but not enough to truly engage in the story. I would have liked either much more action and suspense (there is some suspense in the plot, but not in the style of writing), or a stronger emotional pull to the characters–or both! There were also a couple very gruesome scenes that were much too graphic for me, though aptly reflecting the spirit of the times. I received a complimentary copy of this book from Lion Fiction.